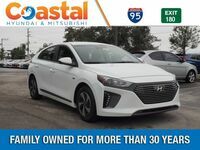 Drivers in the market for a fuel-efficient sedan will find their perfect everyday drive behind the wheel of the 2019 Hyundai Ioniq Hybrid. Built to give drivers an impressive and reliable performance while still offering a feature-filled interior, it’s no wonder why the Ioniq Hybrid is a fan-favorite among Melbourne-area drivers. 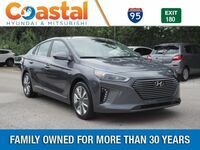 Available for a budget-friendly starting price of $22,400, the 2019 Hyundai Ioniq Hybrid is available in three stylish trim grades – Blue, SEL, Limited. Are you curious to know just how much the Ioniq Hybrid has to offer? 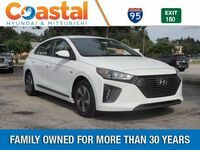 Continue reading to see how this Hyundai stacks up against the competition with this 2019 Hyundai Ioniq Hybrid vs 2019 Nissan Leaf® comparison. What are the differences between the 2019 Hyundai Ioniq Hybrid and 2019 Nissan Leaf®? When it comes to electric and hybrid vehicles, the first thing many drivers want to know is how long they’ll be able to stay on the road before needing to fill up with gas or stop for a charge. 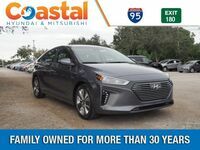 The 2019 Hyundai Ioniq Hybrid offers drivers an impressive EPA-estimated fuel economy of 57 city/59 highway/58 combined MPG. This fuel economy paired with the Ioniq Hybrid’s 11.9-gallon fuel tank gives drivers a fuel-efficient driving range of 678.3 city miles – 702.1 highway miles. The competing 2019 Nissan Leaf® provides drivers with an EPA-estimated driving range of 150 miles. Inside the cabin of the 2019 Hyundai Ioniq Hybrid is a 7-inch color audio touchscreen with Apple CarPlay® and Android Auto™ connectivity. This technology allows drivers to stay connected while behind the wheel by easily sending and receiving text messages, answer phone calls, control music, view navigation, and more. The competing 2019 Leaf® features standard Bluetooth® connectivity inside its cabin and offers Apple CarPlay® and Android Auto™ in specific trim levels. Drivers will be able to carry all of their weekend getaway needs in the 26.5 cubic foot rear cargo area of the 2019 Ioniq Hybrid. The 60-40-split-capable rear seatback can be folded down to help make room for bulky cargo, so you never have to worry about needing to take a second trip.